The first attempt to search for gas was made in 1920. The English Northern Petroleum Syndicate drilled at Finneset in Green Harbour. With them was the oil expert Reynolds. The problem with this attempt was that they were drilling in Store Norske Spitsbergen Coal Company’s field and they had to leave the area after orders from the director Karl Bay. 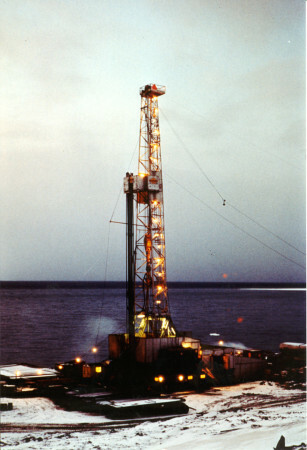 From 1963 until the present day 17 test wells have been drilled without finding any economically viable deposits. In the 1980’s and 1990’s extensive seismic investigations have been undertaken on land and at sea. The conclusion that has been reached is that test drilling is uninteresting at the present time.